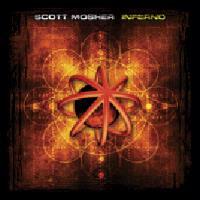 With Inferno Scott Mosher has shown once again that he is an incredible talent to be reckoned with in the harder edged prog field. Musically the album seems to move between Kraftwerkian keyboard sounds, spacey (nearly Hawkwind oriented) textures and song structures and vocal arrangements that call to mind both Dream Theater and Rush. 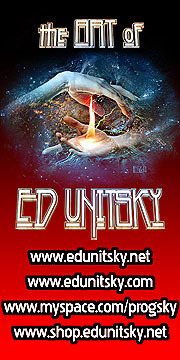 The end result is a consistent release that should please both fans of progressive rock and prog metal. There is really no weak material, but Mosher seems to have a knack for building intensity as he saves much of the stronger cuts for later in the CD. This one is a very solid entry and leaves this reviewer waiting with bated breath to hear where he goes next. Ambient tones begin this. It gets spacey and quite cool, but is just a short instrumental intro. This comes straight out of the last track, fast and heavy, feeling a bit like Dream Theater. Mosher's voice here feels like a cross between James LaBrie and Geddy Lee. This title track is crunchy and quite cool. Ethereal keyboard oriented space tones start this. As the intensity pumps up percussion joins, then the keys weave trails of melody over top. This instrumental, while not wandering far, is rather awesome. Spacey tones end it. Keyboard waves begin this one gradually. The percussion jumps in bringing the intensity and pace up with it. Mosher's voice is less punchy and more melodic on this one. This is a strong modern prog cut that feels at times on the verse like Kraftwerk on steroids. The chorus has more of a unique flavor. An instrumental interlude is based on a more sparse arrangement at first until a very tasty and crunchy guitar solo takes it. This ends abruptly. More atmospheric tones begin this, then Mosher's keys take it into new directions before it kicks into the song proper, a faster paced modern prog jam that is very effective. This one is both dynamically interesting and yet catchy at the same time. It is definitely a winner. Keys take over here in sedate tones. The lines of melody are woven by this instrument, and when he starts singing this is another where his voice calls to mind Geddy Lee a bit. It is another that is both accessible and potent. When he moves it into an instrumental break the guitar work is exceptionally tasty, as is the entire arrangement. It drops to atmosphere and spoken work from time to time, then jumps back up. Mosher pulls out all the stops on this one. Every portion of this number is spot on. This is easily the strongest song on the disc, and well worth the price of admission. More dramatic keys begin this, then the other instruments join in, and the pace picks up. The Dream Theater textures are present again on this killer piece. It twists later into a new triumphant melody that feels sort of like a cross between Yes and Joe Satriani. This instrumental is another smoker. This comes in fast paced and works through that mode for a time, then drops to keyboard textures for the verse. Mosher's vocals here again call to mind Rush's bassist/lead vocalist. The pace and intensity ramp up again. This is another winner, showing Mosher to be on a solid streak, and this is probably the most Rushish song on show here. A more straightforward rocker, this one is a cool one both in terms of the arrangement and vocal performance. Mosher puts in another strong guitar solo to carry the composition out. Waves of keys begin this in mellower terms. Eventually it begins to builds up slowly, then cuts into a strong prog rock jam - not quite the newer metallic form of the genre, but not quite classic prog either. It drops to a dark sounding segment for Mosher's evocative vocal performance. He eventually works it up to the more intense. He delivers his most heartfelt vocals on this one. It alternates between the mellower and harder edged for a time. Eventually the composition moves into a vaguely Rushish instrumental break and the rhythmic pattern here is very cool. This then drops to mellower, spaceier keys for a time before jumping back up to more high-energy Rush-like fury. Then Mosher finds the space for another tasty solo. It drops back to the evocative verse later. This is another killer song. This comes in like a more energized Kraftwerk. This instrumental is pretty laid back and all keyboards. It's a decent track, but I wonder if the last number, as strong as it is, might not have been the better closer for the disc.